Pinecones on Willow? They're Baaack! 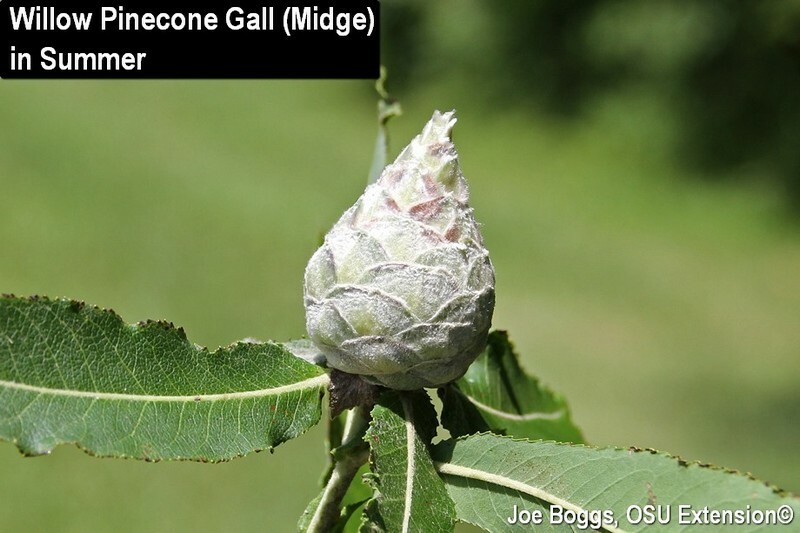 Willow Pinecone Galls are one of the most unusual galls found in Ohio; I post a BYGL Alert! about them every year. Maybe more than one to spread the gall-joy. The galls are created by the Willow Pinecone Gall Midge, Rabdophaga strobiloides (family Cecidomyiidae) to house, nourish, and protect a single fly larva (maggot) located deep within the gall. The literature lists a number of willow hosts; however, I've only ever found them on black willow (Salix nigra). These unusual looking galls bear a striking resemblance to a pine cone complete with faux seed scales. The only thing the gall-making midge fly hasn't managed to replicate is the correct pine cone color; the galls are greenish-white. You can spot them from a distance. Currently, the galls appear ball-like and are almost perfectly round. They will soon elongate into their final "pine cone form." Insect plant galls commonly change their appearance including their shape and color as they "mature." Willow pinecone gall midge maggots spend the winter in the final instar stage within the gall. Research published in 1987 in the journal Oikos showed the maggots survive winter deep-freezes by loading their bodies with "antifreeze" in the form of glycerol. This gall-maker is even found in Alaska. The maggots pupate in the spring with adults emerging just prior to bud break. New galls are initiated when females use their sharp ovipositors (= egg depositor) to insert an egg into an apical bud; these galls always appear at the tips of twigs. They also introduced chemicals into the wound. The chemicals either coated their ovipositors or were found in their saliva, or both. This part of the gall-story is not well understood. What happens next is also poorly understood by scientists, but is one of the most fascinating things you'll ever come across in nature. The chemicals turn plant genes on and off at just the right time to direct the growth of plant tissue to create the gall. It is highly directed growth with the species of gall-maker only ever producing a particular form of gall; in this case, the improbable looking but appropriately named willow pine cone gall. As with the vast majority of plant galls created under the direction of insect gall-makers, willow pinecone galls cause no appreciable harm to the overall health of their plant host. However, this does not mean they can't have some measurable effects on their host. Research published in 1984 in the journal Ecological Entomology showed that the willow pinecone gall midge manipulates their willow-host's growth and development to funnel tree resources to their maggot progeny. Twigs with a gall at the tip become significantly larger in diameter compared to twigs without galls even when the foliage is stripped from both galled and non-galled twigs early in the gall development. You must admit; that's pretty cool.